The first time I heard someone use the word troglodyte in France, I was a little surprised. It conjured up cave dwellers for me. But apparently I was going to be shown their houses – cave dwellers have houses? 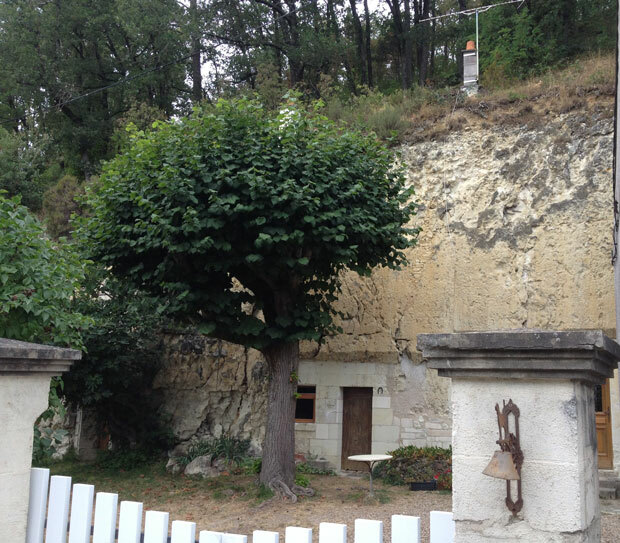 However, it turns out that in French, it also means a house dug out of a cliff. The Loire Valley is very old and in many places both the Loire and Cher rivers are flanked by tufa hills. If someone needed a house or a cellar, they simply dug into the tufa, which is a fairly soft stone. It was then relatively easy to add doors and windows. Ventilation is a problem of course but not insurmountable. I really was intrigued when I saw them. It reminded me of Peter Pan and Wendy and their underground house. The photos here were taken as we rode from Montou along the Cher River to Montrichard. Don’t you just love the details? One even has a TV antenna. And the doors are so low. They weren’t very tall in those days of course. A troglodyte house with a TV antenna! Another area in the Loire Valley well-known for its troglodyte houses is Vouvray, the home of a very good natural sparkling wine made with a local grape called chenin blanc. It may not be champagne but it’s still very palatable – and much cheaper. Most of the cellars have been dug out of the tufa cliffs. 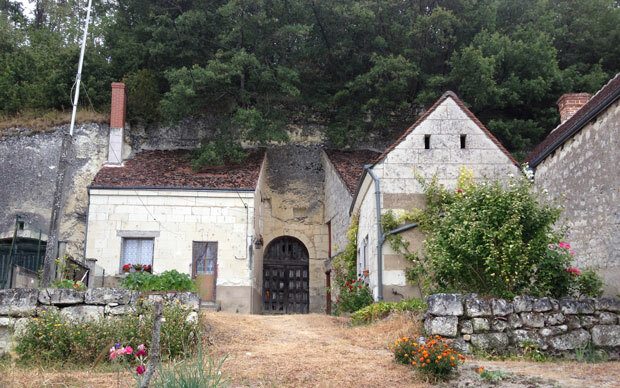 We once visited the most extraordinary vouvray cellar with very, very old wines, that seemed to go on forever. The label on the bottle shows the door of their troglodyte cellar. 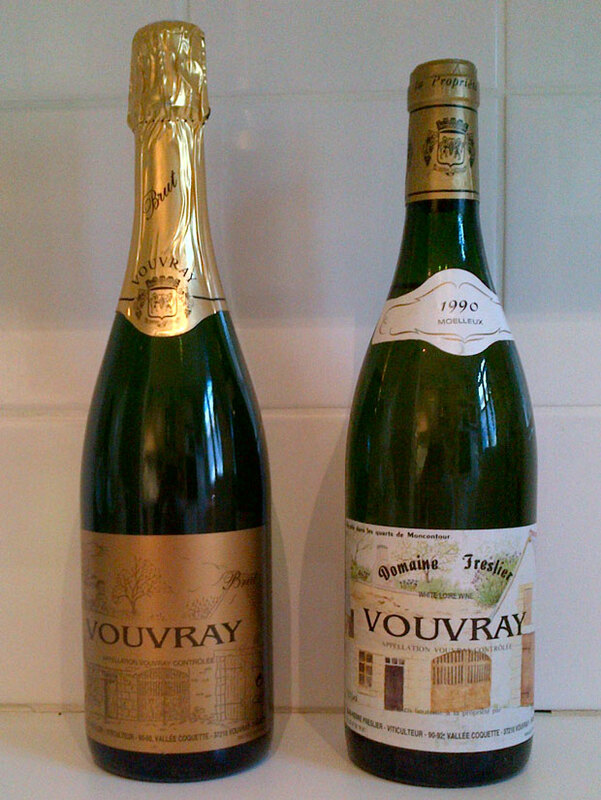 Vouvray is also a very pleasant sweet wine made with the same grape. 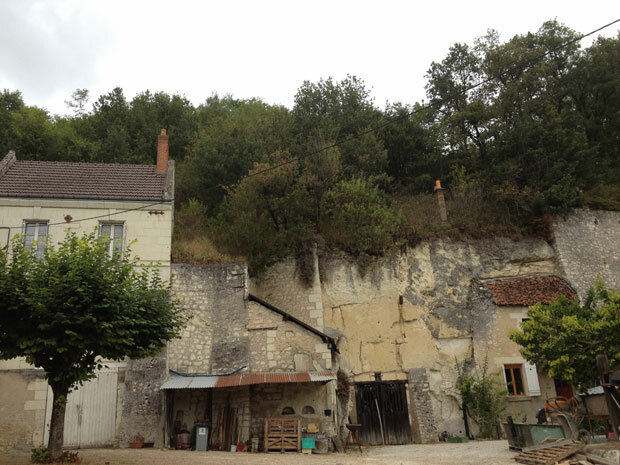 This entry was posted in France, Loire Valley, Sightseeing, Wine and tagged freslier, troglodyte houses, vouvray. Bookmark the permalink. Going to a troglodyte cellar was on the list of things that I wanted to do while we were in the Loire Valley because I had heard about a pizza restaurant (I think) that is in one. Unfortunately, it was closed while we were there so it’s still on my list. Looks as if you’re enjoying you’re time out of Paris! Yes, that was the weekend. Now it’s back to work while the pneumatic drills carry on in Paris without me. And, of course, I’m assuming that the reason that you don’t remember the name of the troglodyte restaurant has nothing to do with the wine tasting that you did beforehand! I imagine the restaurant was Les Gueules noires in la Vallée Coquette. Thank you. It may have been. I just checked it out and its old name “Cave Martin” rings a bell. I’ll have to put it on my list of places to go to. Oh, I didn’t notice them in Baux-de-Provence. Probably too many people… Yes, it would be fun to see inside! There are several troglo restaurants in and around Vouvray. It sounds like you are referring to “La Cave St. Martin” in the Vallee Coquette. They serve traditional local cuisine and have a nice seating area outside if you catch the weather just right…but how often to you get to eat in a real cave!!! A fun time no doubt! I’m definitely going to check it out – but in winter. As you say, how often do you get to eat in a real cave? The pizzas are known as fouée, more like pitta bread and served with copious amounts of garlic butter, mojettes (white haricot beans), rillettes and sometimes wit Nutella. L’Helianthe at Turquant is worth a visit. It has a good menu, traditional food of the Saumur area, beautifully presented, and a good selection of Saumur wines local to the restaurant. Thanks, Jean, L’Helianthe sounds lovely. And thank you for the information about the fouée. We are going to visit a Troglodyte house near Longeais. It should be very interesting. Although I am a huge wine lover, I wasn’t aware of the Loire Valley and Vouvray wine . I would definitely like to try it out.